Cosmic Radiation is made up of high-energy particles which come from outer space (the ‘cosmos’) (see Backgrounder: Cosmic & Neutron Radiation). These high-energy particles can cause cancer and other damage to human tissue (see Backgrounder: Radiation Effects on Cells & DNA). Luckily for us, the Earth’s atmosphere and magnetic field protect us from most of these particles. This backgrounder explains how we came to understand the source of cosmic radiation as well as how this radiation impacts those who work in and travel on airplanes. In the early 20th century, scientists were puzzled about the levels of ionizing radiation (high-energy radiation) in the atmosphere. They hypothesized that if the Earth was the source of the radiation, then radiation levels should decrease the further you travel away from the Earth’s surface. Instead, early experiments seemed to show that the amount of radiation increased. This mystery inspired a young Austrian scientist named Victor Francis Hess to find a way to accurately measure radiation in the atmosphere. The first thing Hess decided to do was to increase the precision of the measuring equipment. At the time, scientists were beginning to use a new measuring device called an electrometer which could detect charged particles. By making sure the device was precise, he could be more confident in his measurements. Next, he needed to get himself and his electrometer up into the atmosphere. He did this using a hot air balloon. Between 1911 and 1913, he went up in the balloon 10 times both in the daytime and at night. He measured the radiation in the atmosphere up to 5.3 km above the Earth. What Hess found was that the level of radiation decreased up to an altitude (distance above the Earth’s surface) of about 1 km. This is what you would expect if the Earth was the source of the radiation. However, at altitudes of more than 1 km, the level of radiation increased. Hess observed that the radiation level at 5 km above the Earth was about twice that of the radiation level at sea level. But what was the source of the radiation? To determine if the radiation was coming from the Sun, Hess went up in the balloon on the night of a solar eclipse. Even with the Moon blocking most of the Sun’s radiation, the radiation level still increased with altitude, suggesting that the radiation was coming from space. The discovery of this “cosmic” radiation led Hess to share in the Nobel Prize in Physics for 1936. As Hess discovered, there is a relationship between altitude and radiation level. The higher you go up, the more radiation you are exposed to. In a small aircraft that flies at an altitude of about 7.5 km (25 000 ft.), your radiation exposure is about 10 times greater than your exposure at sea level. At around 12 km (40 000 ft.), which is the typical cruising altitude of a commercial jet aircraft, your radiation exposure is about 40 to 50 times greater than your exposure at sea level (see Figure 1). The main reason for the greater radiation exposure at higher altitudes is that there is not as much atmosphere between us and the cosmic rays. The atmosphere protects us because when cosmic rays hit molecules in the air, they split into smaller, less energetic particles. The particles keep on splitting and getting less energetic as they come down to Earth’s surface. So, without as much atmosphere to protect us, cosmic ray particles can hit us with much more punch! Where you fly – your latitude - is also important. Cosmic rays hit the Earth from all directions, but our exposure to them is not equal across the globe. This has to do with our second line of defence against cosmic rays – the Earth’s magnetic field. 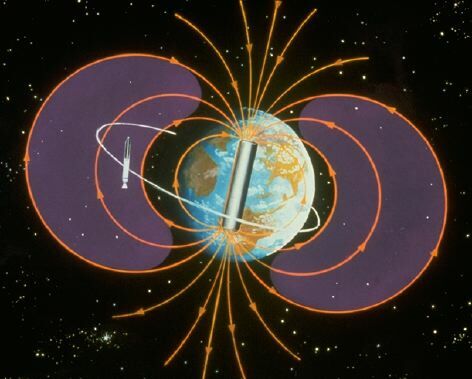 The Earth’s magnetic field acts as a shield which can deflect some cosmic rays. Due to the shape of the magnetic field (see Figure 2), the shielding works best closest to the Equator where the rays come at a right-angle to the field. There is little to no shielding at the poles where the incoming rays and the magnetic field are parallel to each other. In fact, cosmic radiation levels in the polar regions are about twice as high as those at the Equator. People living at the poles are still protected from most cosmic rays by the atmosphere, but for people flying above the poles, their levels of radiation exposure are much higher than when flying closer to the Equator. The Earth’s magnetic field is not the only thing that can deflect cosmic rays. Coronal Mass Ejections (CMEs) can also push aside oncoming cosmic rays. CMEs are clouds of gases together with magnetic force fields that are blown off of the Sun during solar flares. These magnetic fields can repel the electrically-charged cosmic rays that would otherwise hit the Earth. This explains why more cosmic rays reach the Earth during periods of low solar activity. Now that the Solar Maximum has passed (peaked in 2013) and we are heading towards a new Solar Minimum, cosmic radiation levels are predicted to increase. The amount of cosmic radiation you are exposed to while flying depends on the three factors mentioned above - altitude, latitude, and solar activity – as well as on the length of time flying. Overall you can generalize by saying that the higher the altitude and latitude and the longer the flight, the greater the radiation exposure. Did you know? The millisievert (mSv) is the unit of measurement used in the International System of Units (SI) as a measurement of the health effects of ionizing radiation on the body. All people on Earth are exposed in some way to cosmic radiation, but the crews on long-distance flights and frequent fliers are exposed to much higher levels of cosmic radiation than the general population. For example, a study done for Transport Canada found that the highest measured total radiation was 0.052 mSv on the route from Beijing to Vancouver at an average altitude of 11.6 km (~35 000 ft.) for a total flight time of 10.5 hours (at solar minimum). This is about one hundred times greater than the cosmic radiation exposure experienced at ground level. Did you know? The supersonic Concorde airliner, which carried passengers from 1976 to 2003, was the only airliner to include a radiation monitoring device as part of its flight instruments. This wasbecause the Concorde flew much higher (18 km or 60 000 ft.) than other airliners. The study found that with the aircrew they studied, their annual radiation exposure ranged from 1 to 6 mSv per year. These levels are similar to, or even exceed, that of radiation workers in nuclear medicine or at nuclear power plants. It is for this reason that the International Commission on Radiological Protection (ICRP) classifies pilots as radiation workers. The International Commission on Radiological Protection (ICRP) recommends that an aircrew member not be exposed to more than 20 mSv per year (ICRP 1990). It also recommends that the general public should receive less than 1 mSv per year. These recommendations were adopted by the Canadian Nuclear Safety Commission (CNSC) in the Nuclear Safety and Control Act, May 31, 2000. Did you know? According to research done by British Airways, aircrew and passengers on board the Concorde received more than twice as much cosmic radiation per hour (0.012-0.015 mSv/hour) than those flying on a 747 (0.006 mSv/hour), which flies at 12 km (40 000 ft.) altitude. Due to the potential health risk from this higher level of radiation exposure, national transportation organizations such as Transport Canada have made recommendations to help ensure the safety of flight crews. This includes encouraging employers to limit crew time on very long flights, on flights at high altitudes, or on flights that go over the poles. Pregnant crewmembers are also encouraged to not fly during their first trimester. In addition, it is recommended that radiation data from flight routes be used to predict employee exposure and records are kept about the cumulative exposure of crew members. As of 2016, these remain only recommendations, and no regulations exist that force employers to follow these recommendations. Finally, unlike flight crews, no such safety recommendations exist for frequent fliers who may travel as much as some flight crews.